Ten easy deviled egg recipes for any occasion. Ten quick and easy deviled egg recipes for any occasion. 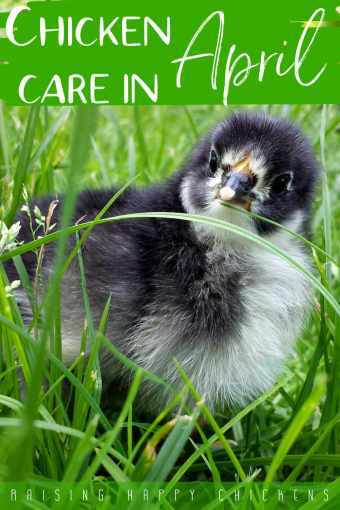 Need a simple but delicious and eye-catching recipe that makes great use of your chickens' lovely eggs? Ever since I discovered how simple it is to make truly delicious deviled eggs, I've been hooked. They've become my trusty stand-by recipes for almost any occasion you can think of - breakfasts, buffets, starters, parties of any size - even picnics. The fact that they're made with my girls' own fresh, healthy, eggs is a bonus. Scrummy deviled eggs - good at any time of day. 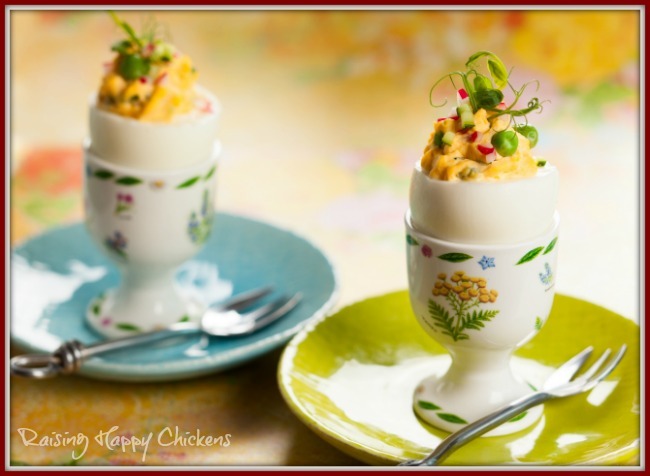 So I decided to share my ten most well-used and well-loved deviled egg recipes with you - and I'd love you to share yours with me too, if you have a favourite. You'll be able to do that at the bottom of the page. 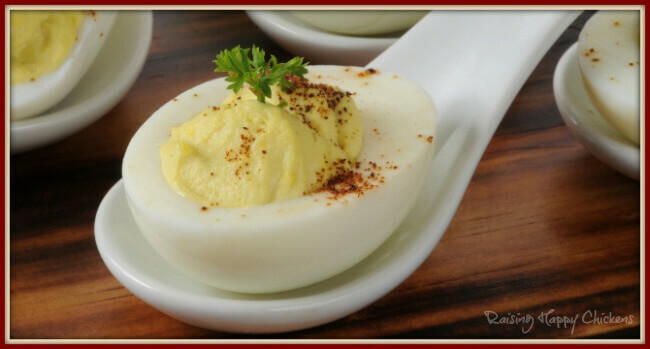 Deviled egg recipes : why these? The beauty about basic deviled eggs is that they can take more or less any topping, so you can change it to suit the tastes of whoever you're preparing them for. I and my family love quite strong tastes, so you may find some of these suggestions too much. That's fine - just use the basic recipe (you can find it here) and experiment until you discover your own favourites. Trust me - they will become family classics. 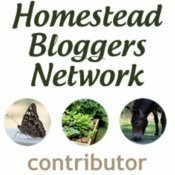 Here are the recipes I cover - if one in particular appeals, just click on its link. Otherwise, scroll through the whole page. 2. A luxury starter dish. 3. A summer evening salad. 4. A single serving for an intimate buffet. 5. A colourful buffet idea. 6. A summer beach BBQ side dish. 10. A centrepiece for a colourful Easter table. 1. Deviled eggs with bacon : a perfect breakfast recipe. This isn't rocket science. 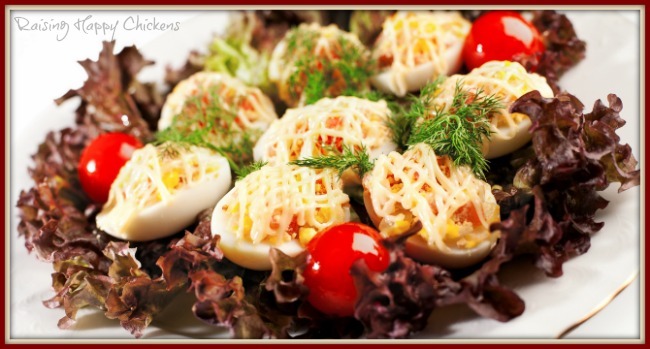 Just take the basic deviled eggs recipe, add cheese and mustard and include them in your favourite breakfast. The combination of flavours is amazing with bacon, tomatoes and sausages . My husband likes to add baked beans too although I find their taste overwhelms the eggs. 2 tablespoons grated cheese - choose the strength according to your own taste. I use a mild Cheddar. 1/2 tablespoon mustard (or more if you like a strong taste). I use English mustard because I do like a strong flavour, but Dijon mustard will also work. Hard boil the eggs, peel and cut in half lengthwise. Scoop out the yolks and put into a bowl. Either grill or dry-fry the bacon until crispy. Crumble and add to the bowl. Add the cheese, mustard and mayonnaise and combine until reasonably smooth. Spoon back into the whites. The huge advantage of this recipe is that it can be made well in advance. 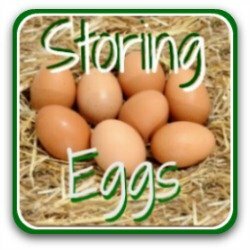 The eggs will keep well in the fridge for up to two days. If you're worried about keeping them in a packed fridge, it's possible to buy a stackable platter with a lid so that they won't get squashed by mistake. Alternatively, rather than splitting them down the middle you can take the top off and stand them in an egg cup (as in the pic above). It's harder to get the yolks out without damaging the white, but they look spectacular. 2. Shrimps and cheese : a starter recipe for a weekend treat. These amounts are enough for 6 people to have one whole egg each. A couple of pinches of cayenne pepper. It helps to make this recipe in a food blender so that everything combines well, particularly if you're making a large amount. I use frozen shrimp for ease; if you buy fresh, you'll need to cook them for three minutes (until they turn pink) either by frying or by cooking in boiling water. If boiling, drain and run under cold water immediately. For either method, dry on kitchen paper. Set one shrimp aside per egg; if not using a blender finely chop the remainder. If using a blender simply add them to the jug. Hard boil the eggs, peel and spoon out the yolks. Add them to the bowl / jug with two tablespoons of sour cream, the dill and a pinch of cayenne pepper . Spoon the mix back into the egg white and top each one with a shrimp. Sprinkle the cheese over the top and, if you like your eggs warm, put them under the grill for no more than two or three minutes. If you don't have dill, either parsley or tarragon work well with this mix. This recipe won't keep well. Keep it in the fridge and use on the day you make it. 3. 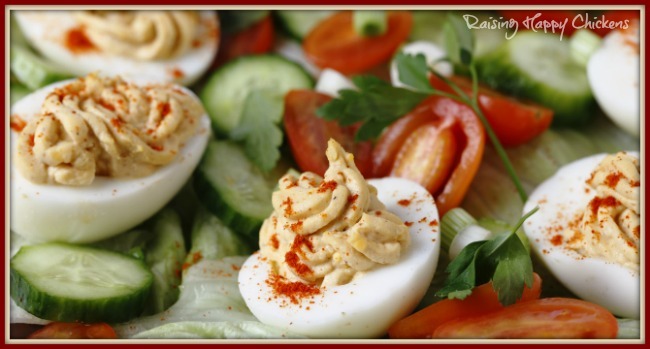 Deviled eggs salad : lovely as a summer evening meal. 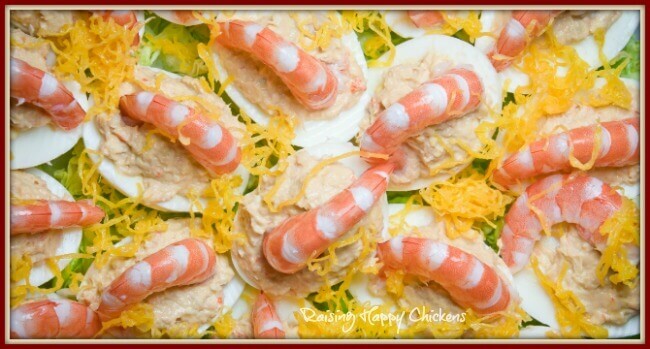 A classic deviled eggs summer salad. These ingredients are for six people to have two whole eggs each as part of a salad. 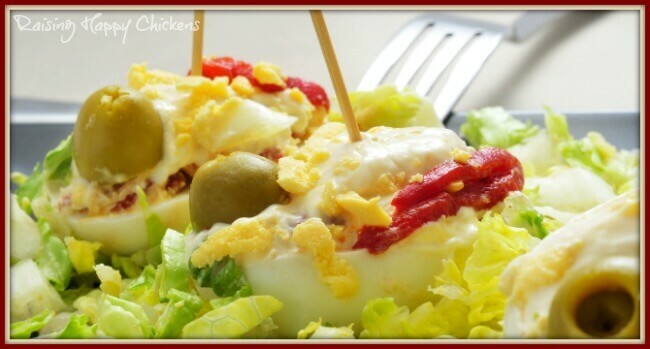 This recipe adds salad ingredients in the eggs themselves to provide texture and a hot sauce to give some added interest, but you can mix and match ingredients to suit your own family's tastes. 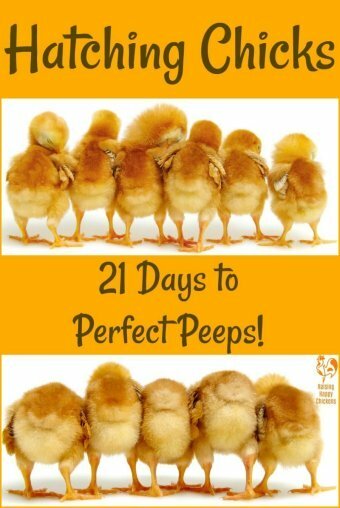 Calculate the basic recipe using 12 eggs and use a mild mustard such as Dijon. 4 oz (half cup) tomatoes, chopped to include the skin and pith but not the liquid and seeds. I've also used sweetcorn in this mix which provides a nice sweetness. Combine all the salad ingredients into the yolk mix and spoon back into the egg. Don't try to pipe it - your piping bag will get clogged up. Finally, if you're feeling extra ambitious, pipe some thick salad cream over the top of the mix. For an extra-classy look, I use dark coloured leaves as a bed because the whites stand out nicely against them. Dot with cherry tomatoes which add a touch of brilliant colour. Deviled eggs as part of a dark leaf salad. 4. Having a small buffet? Present deviled eggs as a single serving. I first saw this done at a celebration buffet my brother threw in a very upmarket hotel in London, England. It always struck me as being a classy and personal way to make a simple dish look amazing. Serve your deviled eggs on a porcelain wanton (Chinese soup) spoon. For a classy buffet, serve an individual deviled egg in a simple spoon. This isn't so much a different recipe as a different way of serving the dish. In the picture above I made the filling a little more liquid than usual, put a tiny sprig of parsley on top for a bit of extra colour, and after I put it in the spoon sprinkled on some paprika and a tiny bit of black pepper. However, any of these recipes would look good in this setting, particularly those which have more colour. The caviar recipe in particular would look stunning against the white of the spoon. The spoons can be bought very inexpensively here if you're in the USA or here if you're in the UK. here if you're in the UK. Try it - you'll find you have a talking point, too! 5. 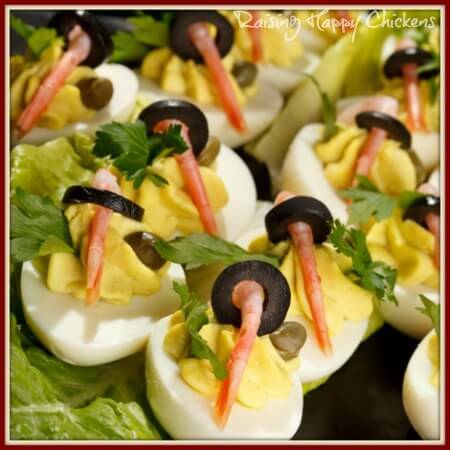 Deviled eggs with sweet peppers and olives : an ideal buffet recipe. Again this is a simple topping for the classic recipe. It looks colourful and tastes delicious - the peppers add a bit of sweetness and the olives, a salty tang. Hint : you won't need any salt added to this recipe - the olives provide enough. Hard boil and split the eggs as usual; remove the yolks and place into a bowl, but keep back a little of the hard yolk from each one. Take 6 of the olives, chop finely and add to the bowl. Cut some of the peppers into 12 thin strips; put to one side. Chop the remaining peppers finely and add to the mix. Put one tablespoon of the mayonnaise or sour cream aside for garnish. Add the remaining mayonnaise or sour cream, cayenne pepper, mustard and hot sauce if you're using it to the bowl. Mix all those ingredients together well, then spoon back into the white. Cut the remaining 3 olives in half across the middle. Put a little mayonnaise or sour cream on top of the mix; then add the halved olive (one half per egg) and two slices of sweet pepper to the top. Take the yolk which you put aside earlier and, using a fork, turn it into crumbles. Sprinkle over the top of the sour cream. If you're worried about the topping falling off, use wooden toothpicks through the middle to hold them together - they work very well. 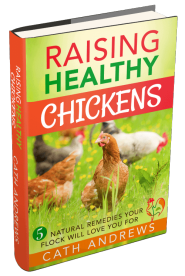 Now all you need to do is present them on a bed of lettuce and enjoy the result! 6. With prawns (shrimps) and olives : great for a summer beach BBQ. Summer and the beach speak to me of fresh fish. If that speaks to you too, you'll love this simple recipe. 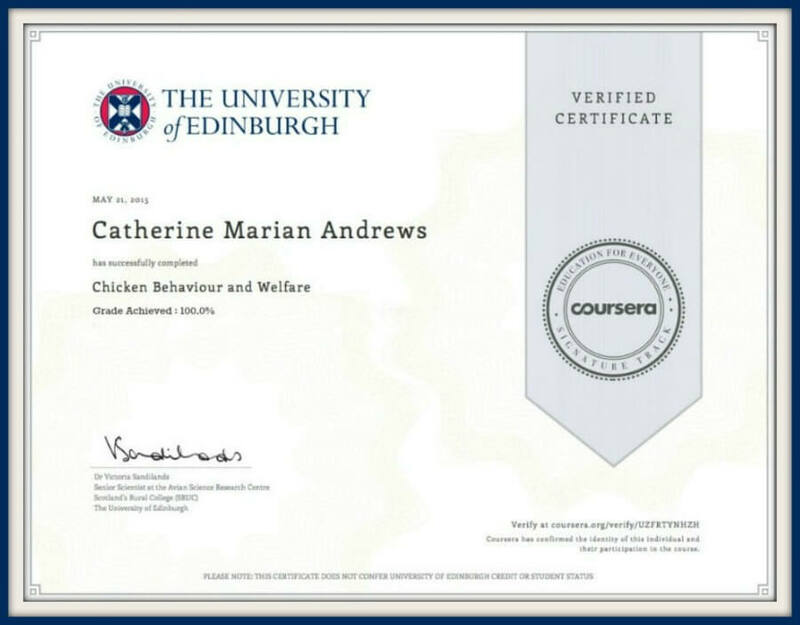 I've used it for both a beach barbeque and as part of a poolside party - it works well for both. Hard boil the eggs and, as usual, cut in half lengthways and remove the yolk into a bowl. Keep back some of the prawns for garnish; chop the remainder finely and add to bowl. Spoon the mixture back into the whites; garnish with parsley, olive rings and a shrimp on each half. Serve on a bed of fresh leaves. I prefer to eat seafood when I know it's fresh, but this dish can be stored in a fridge for up to 48 hours. 7. A healthy lunch recipe that kids love : tuna and chives. 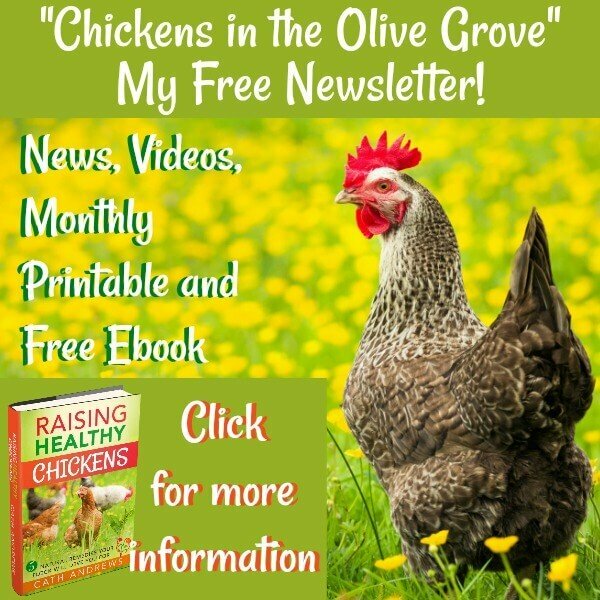 I love this recipe because it's tasty, healthy and low in carohydrates, kids love it and, like most deviled egg recipes, it's very quick to make. Make it with tuna, salmon or crab - it tastes delicious with any of them. I use quite a lot of garlic (what can I say - I live in Italy!) but you can cut it down or leave it out altogether. If you like a salty taste I also sometimes add in capers - one tablespoon is plenty, added in with the mix. 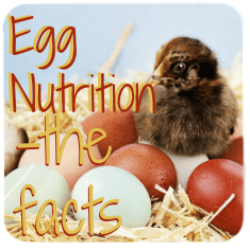 These ingredients are enough to fill 6 eggs (12 halves). 1 teaspoon finely chopped garlic (or to taste). Cut in half and put to one side. Add the garlic to the butter and beat until it's light and fluffy. Carefully take the yolks out of the white and add them, together with the tuna and most of the chives. Mix together well. Garnish using the remaining chopped chives and a dollop of mayonnaise if you'd like. 8. Recipes for that special occasion : deviled eggs with caviar. This is a striking-looking dish for a buffet or a starter at a special dinner party. Using caviar gives a sense of decadence - but it's no longer anything like as expensive as it used to be. Either red or black caviar works in this recipe. 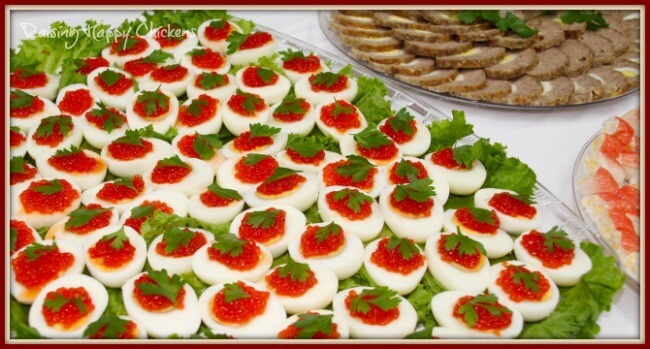 It also looks even more elegant using tiny quail eggs, if you have the patience! Hard boil, peel and cut the eggs in half lengthways, as usual. Remove the yolks and place in a bowl. Add the mayonnaise, mustard and lemon zest and mix together well. Spoon the yolk mixture back into the egg white and make the filling as flat as possible. Now add a scant teaspoon of caviar to the top of each. Garnish with a small parsley leaf and arrange together on a platter. Don't make this too long before you require it - caviar is best served very fresh. 9. Seasonal Variations : Real devils for a scary Hallowe'en! 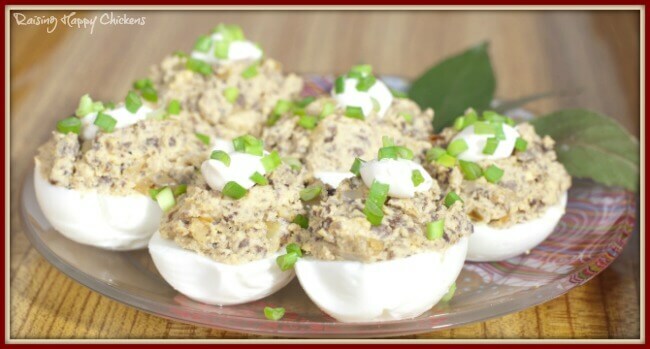 There are lots of different variations on deviled egg recipes which you can use for Hallowe'en. Another of my favourites is to use black olives to make a spider - use a basic deviled eggs recipe and on top of the yolk mix place half an olive for the body and slices for each leg. 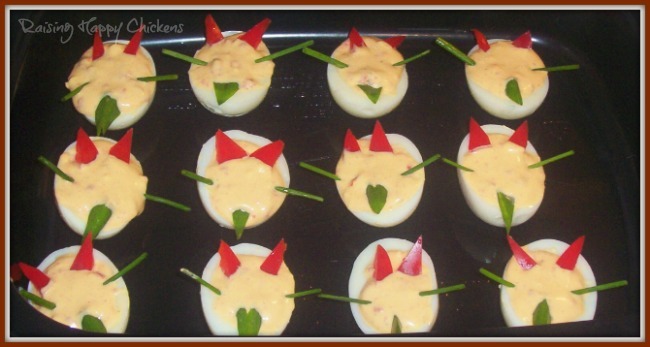 This one, though, is my very favourite : a little devil deviled eggs recipe! Make the basic recipe with a little more mayonnaise than usual so that the 'arms' slide easily into the egg mix. Use chopped chives for arms and green and red peppers cut into triangles for the beard and horns respectively. Kids don't actually mind that it's not the most inventive design in the world - the excitement of Hallowe'en will take care of that! 10. 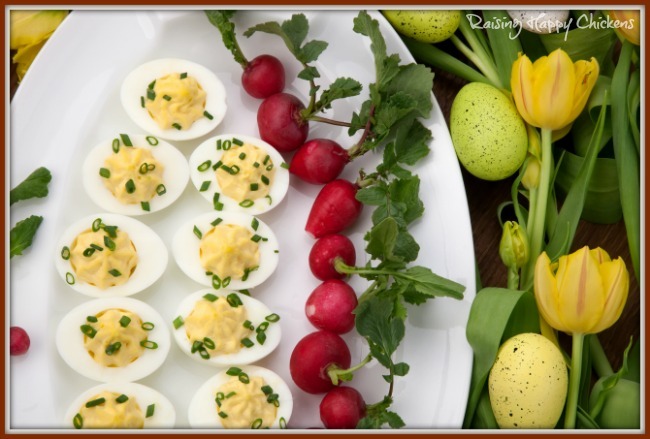 Another Seasonal Twist : an Easter deviled eggs arrangement. Again, this is not about a separate recipe - any of the recipes on this page, or the simple basic recipe itself, would work with this arrangement. It makes a lovely centrepiece for an Easter buffet. 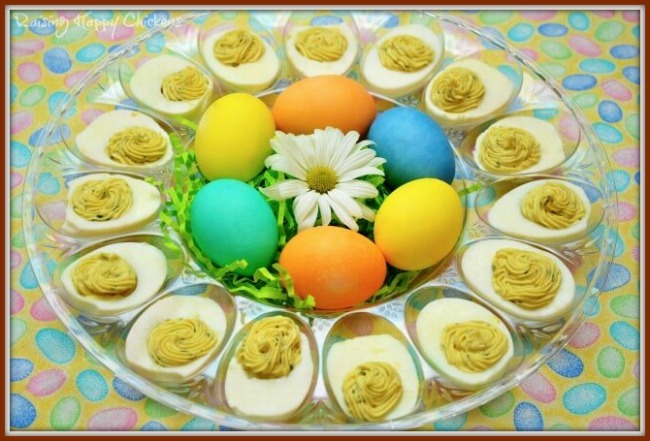 Simply use a deviled eggs platter with a large hollow in the middle, and fill that hollow with whatever makes an Easter table for you - coloured eggs, flowers, a toy Easter chick or two ... Use your imagination! Alternatively, why not use some Spring flowers with eggs from your own chickens to garnish your table? Deviled eggs can look a little 'washed out' so add strong colours to the platter and to the table. 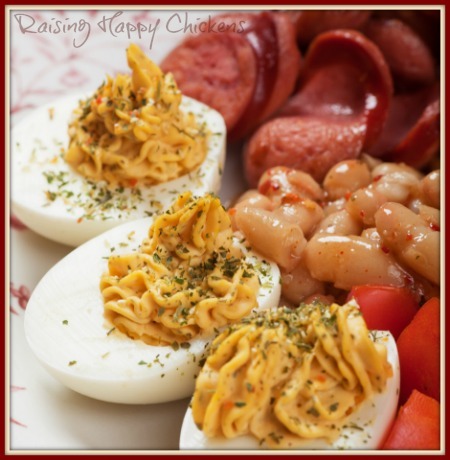 Deviled eggs are one of the most versatile dishes available to you. The combination of your own fresh eggs and some adventurous, imaginative recipes can stand the test of any type of dinner, buffet or party. 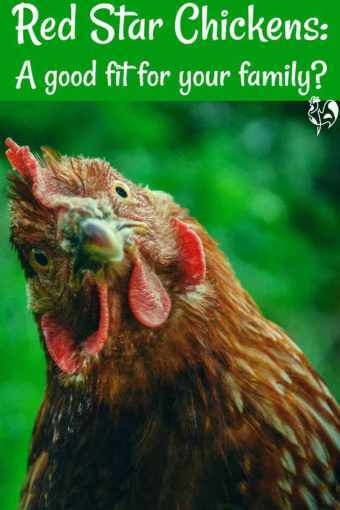 Don't stick with my recipes - think about what your family loves to eat, ask yourself "Would it fit with eggs?" and - even if you think not - give it a try! 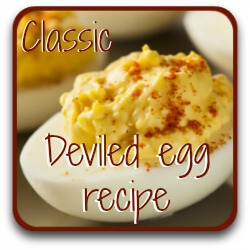 If you've enjoyed this series of deviled egg recipes, you may also be interested in these pages.